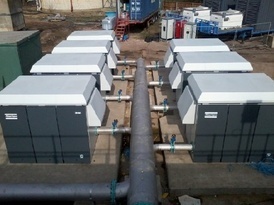 Chiller with galvanised steel panels supplied and installed by Trane UK. RABScreen air intake protection. 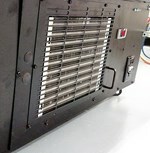 Reduce contamination of coil fins improve energy efficiency and save money. Watch the PreVent video "How to Measure and Install". On larger air intakes we use the Heavy Duty 50mm Webbing Border and the unique GBR-DHD deployment system. Available in both mechanical and automatic operation. Front line defence on an AHU intake using a magnetic strip to create an easy to remove air intake screen. RABScreen protecting the filter banks from local debris. Watch the PreVent video "How to Measure and Install". Just click the link. 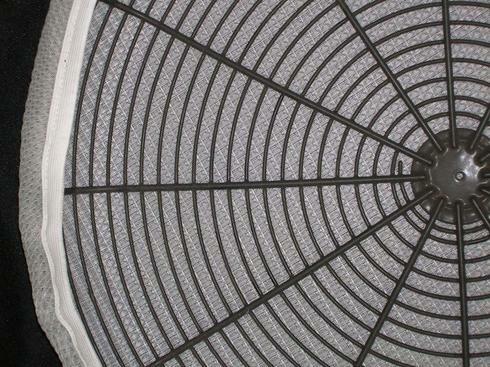 Cooling tower protection using RABScreen air intake protection to the inlet. Reduced contamination of fill. Saving money on cleaning & disinfectant.Watch the PreVent video "How to Measure and Install". Just click the link. 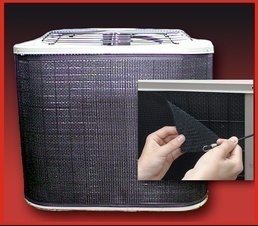 Simple wrap around RABScreen protection made to suit your condenser. Covering all coils and locked in place with Permatron bungee cords. No fixing required. Magnetic framed RABScreen air intake protection secured to weather cowl inlet on a high efficiency compressor. No more oil cooler coil contamination and an easy to fit/remove filter screen. 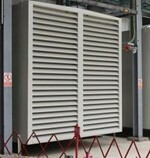 RABScreen air intake filters are perfect for generators. If you have a dusty or dirty environment just fit a RABScreen and keep your generator free of debris.Use your hand, a soft broom, vacuum cleaner or hose to remove the surface debris. It just rolls off and even rainfall will do the job for you. 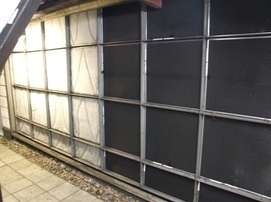 Protect low level coils from foot traffic debris with magnetic RABScreen air intake protection. Easily removed for cleaning by retail staff.Watch the PreVent video "How to Measure and Install". Just click the link. How to clean a RABScreen air intake screen? Use your hand, a soft broom, vacuum cleaner or hose to remove the surface debris. It just rolls off and on external units, rainfall will do the job for you. This cooling tower fan was drawing in grass clippings and pollen laden air to the sump. Easily stopped by a RABScreen air intake screen. Protect equipment motors, workers and products from dust and contaminants with bonnet style equipment protection air filters. Use on circular fan guards, ventilation exhausts or any air intake opening.